KFC UK promotes, in a hilarious new advert, the KFC Ricebox, containing the same great Original Recipe chicken, just with rice instead of fries. 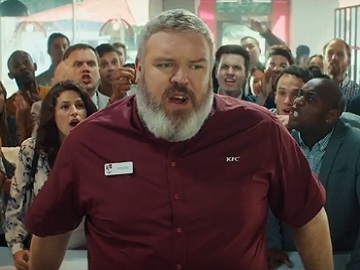 The 65-second spot, titled “Lunchtime is coming”, features the lunchtime rush at a KFC restaurant, where a hungry horde orders chicken with fries. The cashier, letting his coworkers know that they have to prepare “chicken with fries”, says these words so many times until they turn into “chicken with rice”. At some point, a young man shows up from the crowd saying that that’s his order. The ricebox meal includes a piece of the KFC’s Original Recipe chicken fillet with steamed Tex Mex rice, fresh lettuce, sweetcorn, chopped tomatoes and a bean salsa, drizzled with a light garlic dressing.